In part one (https://algray.com/?p=169) we discussed how today’s engineering tools create information rich repositories that require a purpose-built content management system in order to manage information to the depth possible. Having such a system also allows for powerful review environments that can assemble 2D & 3D content (and ancillary data) in order to facilitate incisive decision making. Because ProjectWise manages engineering content to a depth that perceived competitors do not, it is also able to provide much more robust reviewing capabilities. 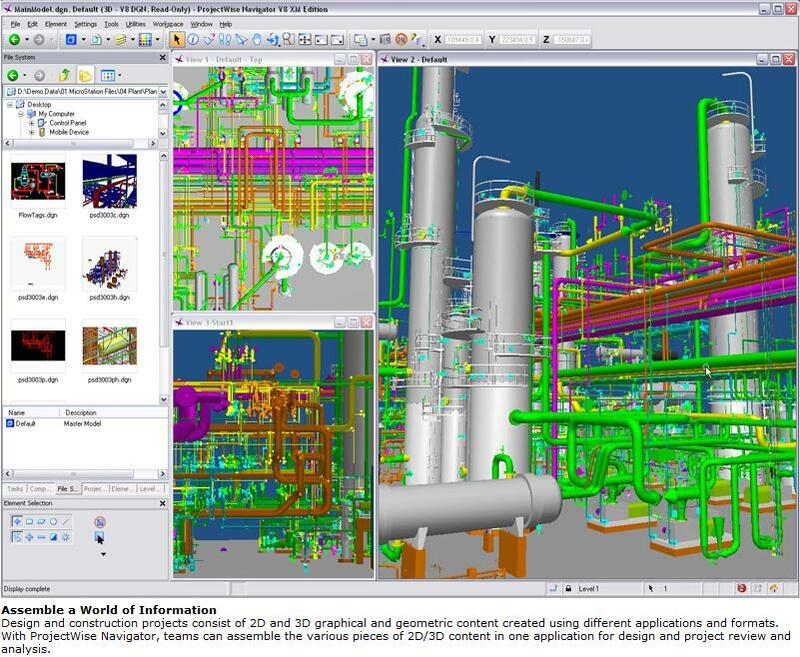 Bentley Navigator can access geometric, 2D/3D graphical, and non-graphical project content from hundreds of office, graphics, AEC and infrastructure design applications. Gathering and incorporating feedback from key stakeholders (project reviewers) is notoriously difficult. Review and approval requests can get lost. Feedback does not get back to the right person or it arrives too late. Lots of people need to contribute ideas and feedback, but they often lack the tools to open, view, and mark up files. And usually, there’s no clear workflow for capturing that feedback and routing it to the right people for incorporation. When paper drawings are marked up in the field, collecting those changes usually requires scanning, attribution and connecting the scanned drawings and attributes back to the digital source so the model can be updated to the as-built condition. It’s not atypical for some organizations to have rooms full of unscanned paper which means that the digital model is not reflective of the field condition. Lack of trust in the digital model frequently means resurveying of some type. ProjectWise addresses this problem by supporting a dynamic, closed-loop review process that captures feedback from reviewers and then automatically returns it in context so that it’s instantly actionable. Reviewers can provide feedback from anywhere – on a PC, using an iPad, on paper while at a construction site, and online or offline. ProjectWise automatically synchronizes captured feedback with the appropriate source document, generates an audit trail, and can alert the appropriate team members. This makes the process of integrating feedback and changes a fast, reliable, and systematic process. ProjectWise also tracks all reviewer feedback and makes it visible to project teams. Stakeholders can securely access documents and provide feedback without altering the originals. In addition, anyone can mark up paper plots and instantly synchronize those markups with the original, digital file. Detection and resolution of clashes and schedule simulations. Project teams can simulate and resolve design clashes during the design phase and optimize schedules to eliminate on-site errors. Review of component information, filtering views of models and precise measurements. ProjectWise exposes valuable information locked inside engineering documents, enabling team members to find individual components and measure areas and distances with full engineering precision. To pull off this sort of depth in reviewing of design content, the system needs to be designed with this sort of functionality in mind as a central concept. A bolt on 3rd party that generic EDMS systems employ just isn’t going to suffice.